We are a Baptist church believing in salvation of sinners by Grace and through Faith alone. We believe the Bible to be the inspired, inerrant Word of God and the only authority for the governing of the local church. We believe that Jesus Christ is the only begotten Son of God, was born of a virgin, lived a sinless life, was crucified & buried, and rose again for our justification. We believe Jesus Christ is coming again! Getting ready for our Bible Conference here at Cornerstone! April 22-25, 2019, 7:00pm nightly. MP3 "How Not To Be Defeated"
MP3 "Who Is Responsible For Helping Others?" Hear more sermons here, or check out the Audio Archives by year on the menu to the right. We would like to invite all adults and teens to join us on Wednesday evenings at 7:00 for Bible study. We offer Sunday School classes for Adults, Teens, Beginners (Grades 1 +) and Preschoolers. There is a need for more workers and more members in the classes. We hope you will join us for Sunday School each week. White Oak Manor – Every Tuesday at 7p nursing home ministry at White Oak Manor with Billy & Tonda Burgess and family. Everyone is invited to attend and enjoy the blessings of visiting with the residents and sharing God's love in deed. Weekly on Thursdays at 6:30 PM & Saturdays at 10:00am. Please let the pastor know in advance if you plan to join us in visitation. 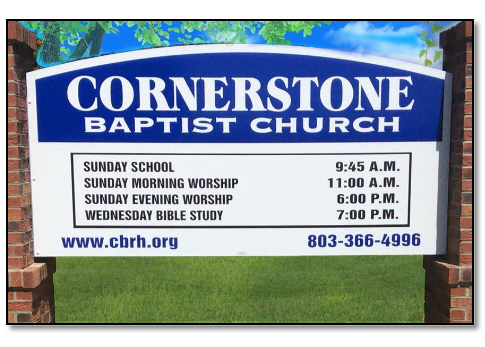 We have posted streaming audio of each service's sermon. Sermons are presented with the most recent appearing at the top of the list. These files are specially coded to play automatically inside of your web browser. Each audio file is optimized for a quick start and a great sound, even on a dial-up connection! Click here to pick a topic.